This book brings together a representative collection of perspectives on the way how corporate governance is being aligned with the social responsibility of an organization and the accountability of its management both in large corporations and in medium sized businesses. Examples are given from various industries and branches as well as from different countries and regions across the globe. All examples are commented and explained in detail. 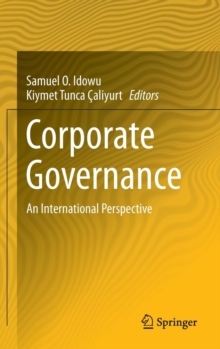 Written by a group of selected academic teachers this book is suitable for adoption as a resource for a case driven approach to teaching "Corporate Governance" courses at an upper undergraduate or graduate level. Pages: 371 pages, 26 Illustrations, black and white; XXXVIII, 371 p. 26 illus.